As digital tools have become more ubiquitous in homes and classrooms, it has become imperative to research the impact of digital media, games, and experiences on young children’s learning. 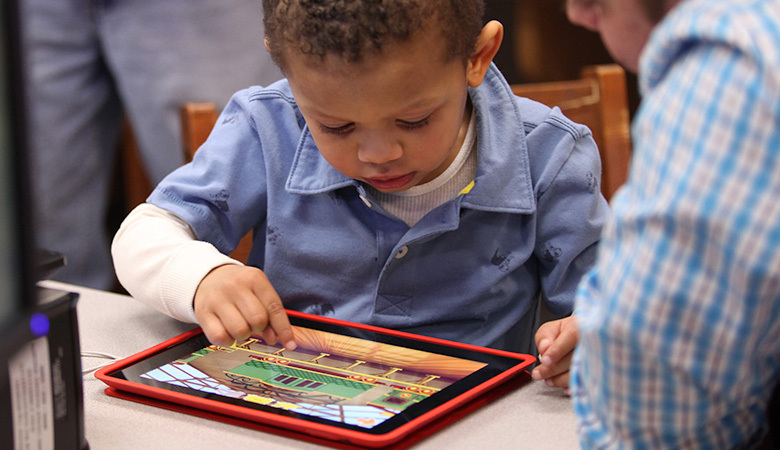 EDC has long been committed to understanding how technology can support early learning. Since 2006, the Corporation for Public Broadcasting (CPB) has turned to EDC to evaluate the public media system’s signature early learning program, Ready To Learn, a national initiative funded by the U.S. Department of Education (ED). Ready To Learn maintains that public media has the power to improve young children’s school readiness. Our research and evaluation program has been instrumental in helping CPB and PBS develop media-rich literacy and math learning resources that support school readiness in high-need communities. Our studies have shown that children exposed to PBS KIDS resources improve in emergent literacy skills—such as naming letters and knowing concepts of story and print—and math skills, such as counting, recognizing shapes, predicting patterns, and problem-solving. Our studies have also shown that use of PBS KIDS content across media platforms supports teachers’ confidence as well as family engagement. In this study, EDC and SRI researchers explored how time spent viewing and playing with PBS KIDS educational, noncommercial media can benefit young children’s learning, especially those growing up in lower-income communities. The research goals were to (1) explore how transmedia can support children’s early mathematics learning and (2) substantively address the central role that parents and caregivers play in children’s learning.